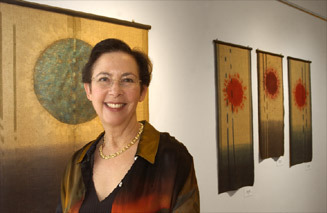 After being involved in the San Francisco Art to Wear movement in the 1970s and 1980s, Barbara shifted her focus to non-functional textile art. Barbara's wall pieces speak of historic textiles of many cultures, burnished with the patina of time and imbued with a very personal sense of beauty. Through her many publications, workshops, and lectures, Barbara shares her knowledge as an educator and writer. She also served on the boards of the Textile Society of America and Textile Arts Council of the Fine Arts Museums of San Francisco and was a docent at the Museum of Craft and Folk Art.